Sunshine. Blue sky. Turquoise water. Lush landscape. Warm breeze. Laid-back living. This is the life. This is, more specifically, island life. This is paradise. Now, how can I make this my life? That is the question Teresa and I asked ourselves as we dangled our legs over the side of a catamaran sailing across the gorgeous clear caribbean waters surrounding the beautiful island of St. Thomas. My dream is to someday live on a tropical island – if only for a year. Just to experience that coveted island life for a time. But on this day, I had but a few hours to get my island spirit on and enjoy as much sun, sand and sea as I could! This was the third full day of our 7-day Disney cruise and we were up early and looking forward to a day spent in the great, tropical outdoors. As we had booked an excursion and had to be at our designated onboard meeting location by 8am, we had ordered room service for breakfast the evening before. 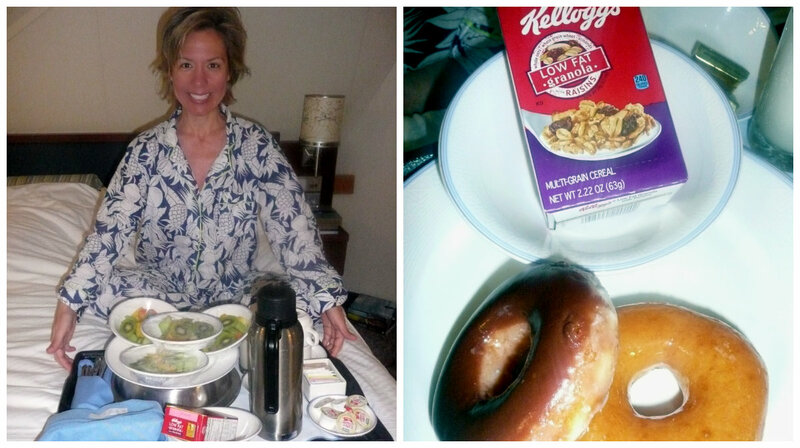 Not a whole lot of breakfast options on the menu but we made do with the fruit, english muffins, granola with almond milk, and donuts that were delivered to our room promptly at 7:30. 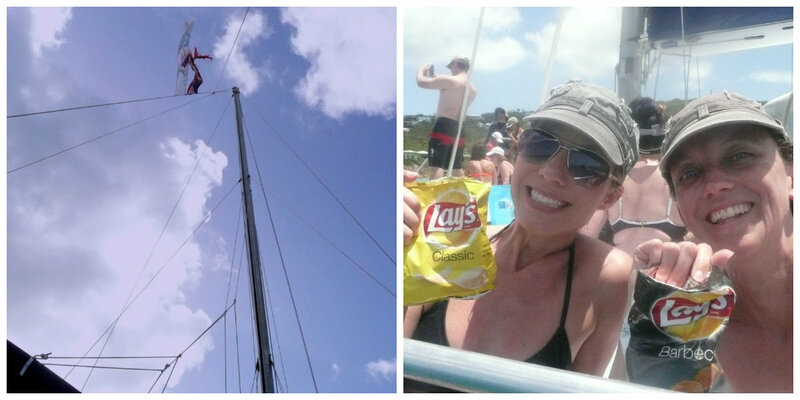 After much deliberation, we had decided to select an excursion that included a catamaran sail plus time spent on a beach. Beach time was our number one desire and the catamaran ride was an (incredibly enjoyable!) added bonus! The three of us (myself, Teresa, and her mom, Karen) disembarked the ship with the rest of our excursion group and were met onshore by a representative from the tour operator that was running this particular activity. We had to wait a few minutes before our catamaran, the Dancing Dolphin, arrived to pick us up. We were really blessed that our tour group was relatively small and there was plenty of space on the boat to stretch out and relax. I spent the entire 25-minute ride sitting on the deck in the sun, watching the gorgeous scenery sail past, and feeling like this is where I belong. I feel worries and stresses melt away in these beautiful locations! Be it an island or a mountaintop – nature speaks to me and calms me like nothing else. 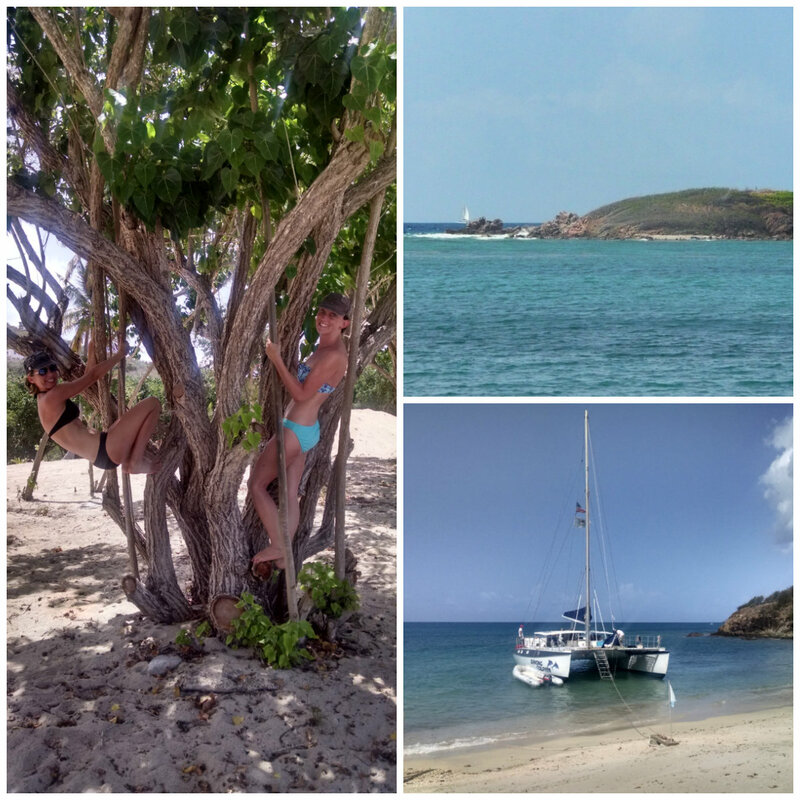 Our catamaran ride took us to ABI Beach – a newly opened private beach accessible only by boat. The thirty or forty of us on this excursion were the only people on this stretch of beautiful white sand. As we neared shore, we were all wondering how we were going to get from the boat to dry land. What we weren’t expecting was to climb down a ladder into the chest-high water, carrying our bags above our heads to shore (or in my case, asking one of the crew members to carry my bag for me 🙂 ). I’m just glad I already had my swimsuit on! We nabbed one of the lovely couch/bed/loungers in the shade and dragged a couple of sun loungers over as well. Can I just stay here forever? It was so, so lovely and peaceful on this quiet, private beach! Teresa and I walked around a bit, visiting the small sundries shop and checking out the bar offerings. Then we decided it was time for a(nother) dip in the sea! The water was definitely chillier than I had expected the Caribbean to be but I finally made it in over my head (it only took me ten minutes or so…) and joined Teresa in floating around on our pool noodles enjoying the crystal-clear water and the peaceful surroundings. After some time we swam back to shore and laid out for a bit. Before we were even close to being ready to leave, we heard the call for “all aboard”. So sad. I would say that was the only down-side to this excursion – it didn’t last long enough! We took our time gathering up our stuff and taking some more pictures before wading back out to the boat. 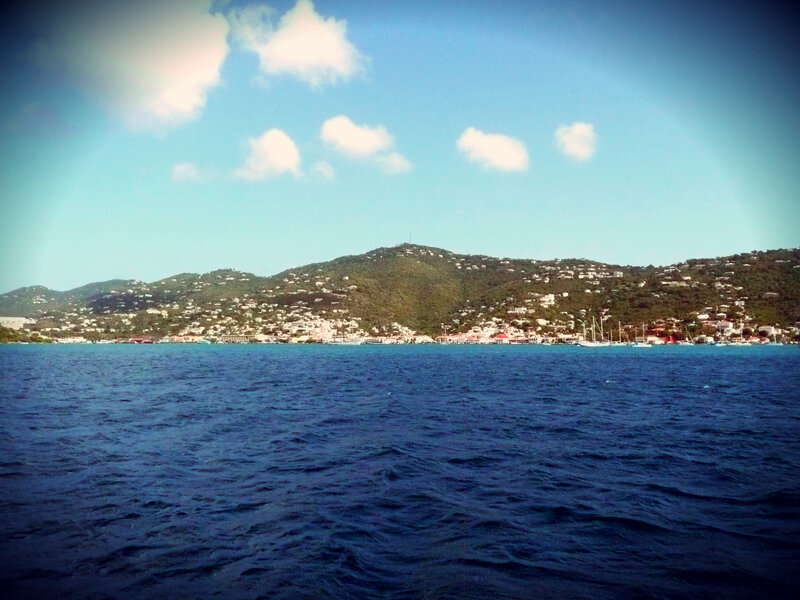 The return sail to the cruise port in Charlotte Amalie was just as enjoyable as the out-going one! The crew kicked up the fun atmosphere a bit by playing music and serving drinks. 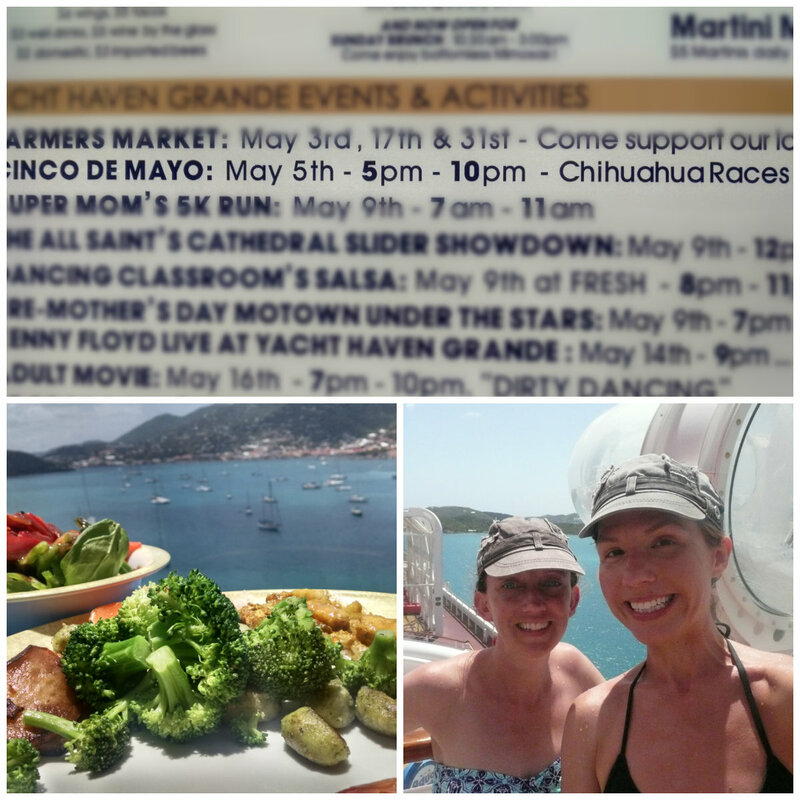 Once back on land again, we took a quick stroll through a nearby shopping area then headed back to the ship. We went straight up to Cabanas for lunch then decided this would be the perfect time to ride the Aqua Duck while half of the ship’s occupants were onshore. The Aqua Duck is a fun “water coaster” which begins on deck 12. 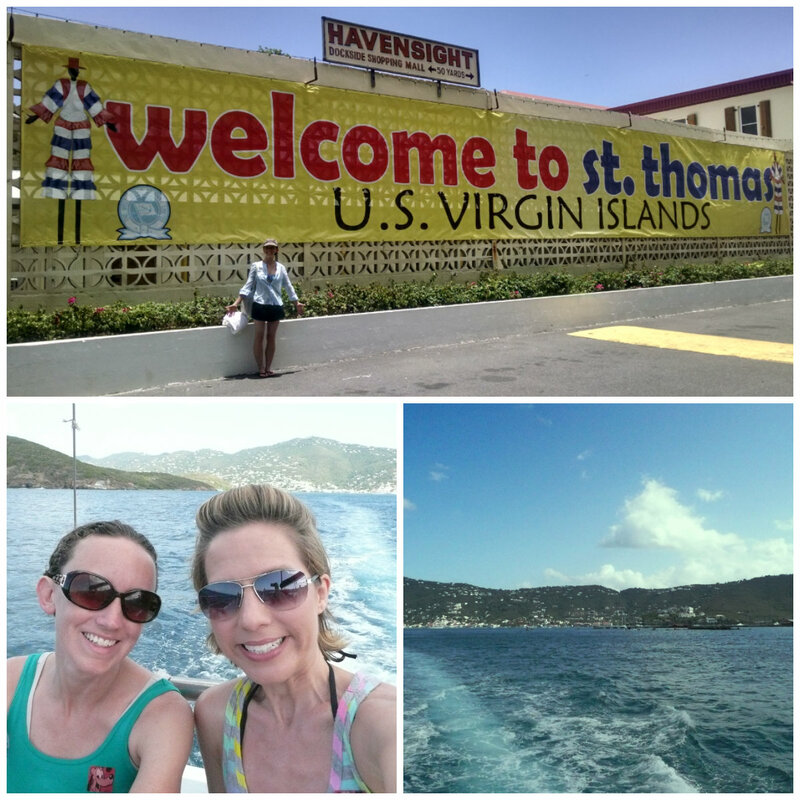 Teresa and I waited in line for about 20 minutes then boarded a 2-person inner-tube. 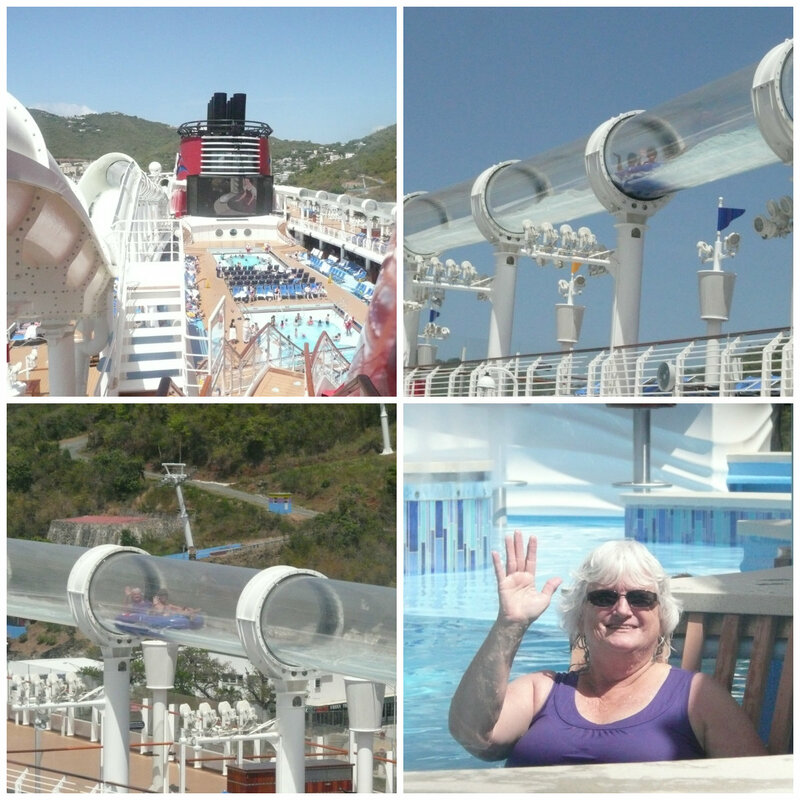 For most of the ride, travelers are speeding through an enclosed clear tube, parts of which extend out past the ship. It was actually a lot of fun! 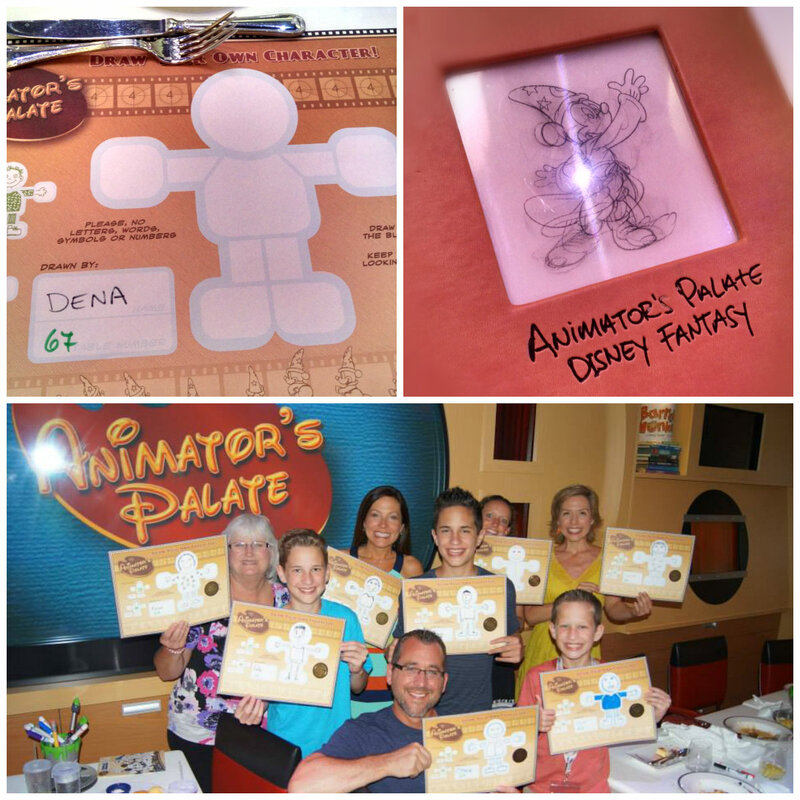 For dinner this evening, we were back at Animators Palate and an experience we had all been looking forward to! At each of our seats there was a marker and a large sheet of paper. We were instructed to draw a character within a specific, outlined space on the paper. For someone who has less than zero artistic abilities, this was quite a challenge. After 15 minutes, Nicola came by to collect our “art”. After our entrees were served and eaten, the “show” began, starring….our one-of-a-kind characters. I had been told about this fun experience prior to the cruise but had no idea just how cool and unique it was going to be! Our hand-drawn characters came to life on screen and danced and interacted with each other as well as many Disney characters. It was seriously one of the neatest things I’ve ever seen. And I have no idea how it was done! It was just amazing. Below is part of a video I took (my character made few appearances – not surprising since she looked like a frizzy-haired, psychotic cat lady). Such a fun dining experience! After dinner we attended the nightly entertainment at the Walt Disney Theater. Tonight was a different kind of show – not a Disney production but an outside group called Buckets N Boards. They entertained everyone with their mad percussion skills, tap dancing, comedy, singing…they were quite the talented duo. I noticed in your article you stated: “Our catamaran ride took us to ABI Beach – a newly opened private beach accessible only by boat”. The beach is called Frenchman Bay, not Abi. The beach bar is named “Abi”.